When you have a more comfortable budget to splash out on good quality dress boots, you don’t want to waste your money. After all, $300 is a lot of money no matter your level of wealth! If you like the sound of a particular pair, use the links above to jump down to them. Afterwards, we’ll talk a bit about what $300 will get you in the way of dress boots and what you can expect for your money. You can use the Quick Buy Guide below to glance over our recommendations and head straight to the retailers. However, if you have time to peruse each listing, you can scroll down to learn more about them. What Are The Best Men’s Dress Boots Under $300? Made from calf crust leather from the brand’s own tanneries, Ecco’s stylish boots include their proprietary Fluidform technology for extra cushion. In order to created a distressed and vintage style, the unfinished leather is hand buffed and polished. A classic interpretation of the wingtip boot with an artisanal appearance, these are great boots for both casual and business casual wear. Whether you’re on a day out or dressing down for the office, these look great with jeans, chinos or even wool trousers. The “nature” brown leather is by far our favourite colour as it will also be the most versatile. However, there is a much dressier black, which could be worn more formally with a business suit if you prefer. A great boot for the winter months, the burnished Italian calfskin leather has been lined with genuine shearling for extra warmth. Meanwhile, he construction features a storm welt, which is similar to the Goodyear but offers slightly better water resistance. Finally, an ecological crepe rubber sole provides excellent traction. As mentioned above, these are great boots to don during the colder, wet months. They can be worn casually but even as a business casual option when braving poor weather on your morning commute to the office. We’d actually even pair them with a suit if you want to have a look that really pops. Available only in brown, these will remain quite casual compared to some other boots listed here. However, the balmoral cap toe will help render it slightly more formal when needed. Although different from their Original boots, these are part of Wolverine’s 100-Mile Collection. With a more modern yet artisanal take on the classic chukka style, it’s remarkably stylish with extra eyelets and wingtip brogue details. 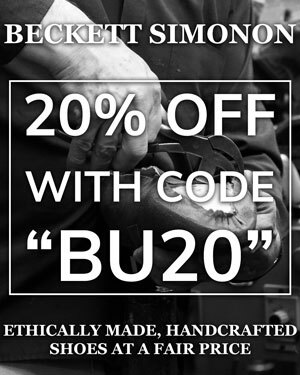 There’s also a Goodyear welt construction, which is a demonstration of its quality. Oscillating between casual and business casual, we would even go as far as wearing these professionally depending on the colour. Whether you’re sporting them with raw denim or ironed chinos, they look absolutely fantastic with the right wardrobe. You can choose between black or brown full-grain leather, which are both leaning towards the casual end of the spectrum. This is largely because even the black shoes have traces of brown leather in the midsole. Nevertheless, they’re very stylish indeed and would work with a stylish yet not overly formal suit. Another stylish Blucher boot from Johnston & Murphy, the Bryson is part of the brand’s 1850 Collection, which seeks to create distinctively artisanal footwear. Handcrafted in Italy from premium calfskin, the leather has been dip-dyed and washed to create remarkably supple and soft boots. With their very vintage aesthetic, these boots are more casual than the other options available. The leather has a pebbled effect and is very supple, which means it doesn’t retain any formality. 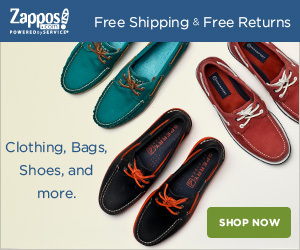 Therefore, these are best worn casually with jeans or could be business casual with chinos and a tweed sport jacket. Depending on your needs, you can choose between two colours. However, the black leather is very formal as it has a matte finish, which makes it look quite grey. 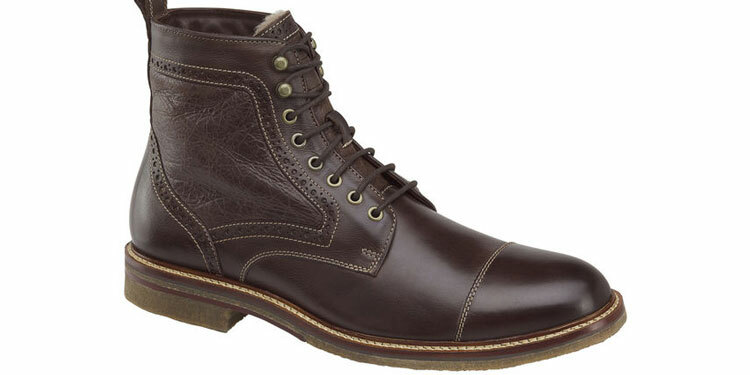 Meanwhile, the brown has a lovely burnished look that brings out the boots’ more nuanced details. Another offering from Johnston & Murphy’s 1850 Collection, these stylish Chelsea boots are a great alternative. Handmade in Italy from soft-tumbled Italian calfskin, contrasted stitch really brings out all the brogue details across the uppers. There’s also an OrthoLite foodbed for extra comfort when standing. Slightly more formal than the boots above, these are still relatively casual. We’d recommend these boots for primarily business casual wear as the broguing renders them quite dressy but not so much that they could be worn with a suit. Although these are only available in Oxblood brown, they’re very beautiful boots and it would likely be the colour of our choice anyway. The tan leather sole and stitching adds stunning contrast to the boot for versatile yet stylish casual wear. As another Chukka boot, these are a great option to consider. A very stylish offering from Ted Baker, they also include an EVA and PU sole for extra all-comfort for when out and about. Pebbled leather quarters add extra detail against the smooth leather uppers whilst contrast stitching makes their details pop. Again, these are casual to business casual wear. We’d recommend them with dark denim and a check shirt when worn casually. Alternatively, they’d look great against a tweed sport jacket and dark chinos for business casual settings. Available in either tan or black, your choice should largely depend on their general use. Overall, we have a preference for the tan, which features a burnished and stain look. In both our guides to $100 and $200 dress boots, we stressed how investing in quality footwear provides long-term value for money. Although buying cheaper boots may save money in the short run, the inferior quality may result in higher maintenance costs or even replacing the boots early. However, since you’re here, you probably already appreciate the importance in paying more for better quality boots. In fact, the $300 price point is quite significant for boots as the market becomes a lot more dynamic and grants access to a wide variety of footwear. Nevertheless, let’s explore the benefits you’ll gain from investing in $300 dress boots. Once you’ve surpassed the $200 price point, manufacturers will often be able to craft shoes and boots from much better quality materials. If you’ve already shopped around, you’ll have likely noticed terms like “full-grain” and “calfskin”. Given that quality hides and certain grades are so expensive, it’s very rare to find these on cheaper boots. Furthermore, if they do appear, you may ask yourself from where they were sourced. However, between the $200 and $300 price points, you’re entering the premium market and will begin to see a rich variety of footwear. You’ll unlikely see particularly low grades of leather that damage easily or lose their shape within a few weeks of wear. Instead, you’ll benefit from higher leather quality, featuring tough and tight fibres that retain their shape but breathe comfortably. Cemented soles is a hallmark of cheap footwear, which comes apart after a few months. Meanwhile, the Blake stitch performs well but doesn’t provide much longevity either. However, once you’ve crossed the $200 threshold, you’ll begin to see a lot fewer shoes on sale that use these construction methods. If you do, that’s because they either have other specialist features or come from a designer brand. Instead, the Goodyear welt, as well as variants such as the Storm welt, become much more common. A time-consuming and expensive procedure, it includes more than one stitching process in order to join a shoe’s various components together. A Goodyear welt makes your footwear much easier to recraft as the soles can be easily replaced. For instance, Blake stitching often uses a single stitch to join it all together. Whilst it’s much faster, it makes it harder to effectively resole the shoe. 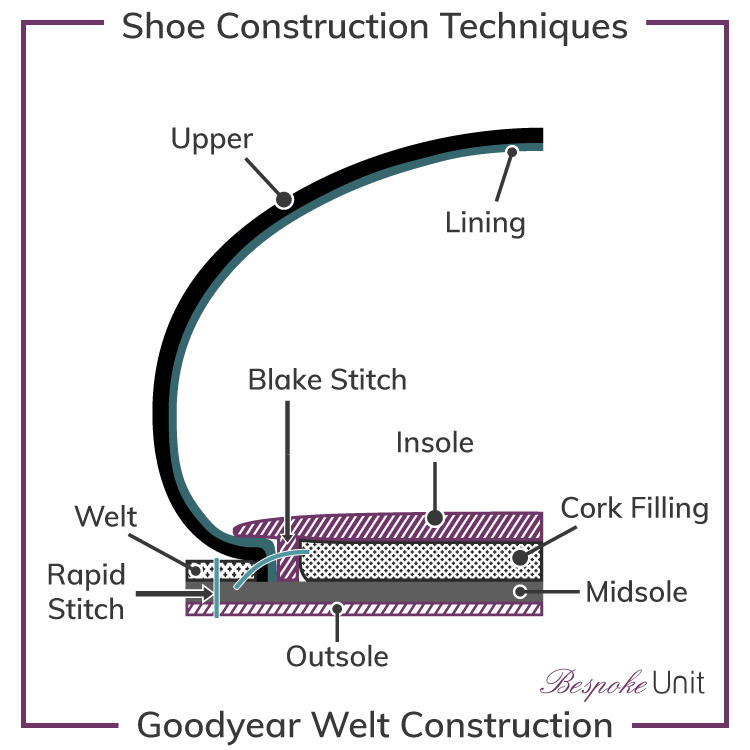 Similarly, Goodyear welts are much more robust and offer superior water resistance. Therefore, it makes for a much more practical shoe and drastically increases its life-span. Once again, the sub-$300 price point sees much more consistency than lower ones when it comes to soles. Rather than injection-moulded rubber or cheap leather, you’ll see more elaborate soles composed of leather, rubber or a combination of the two. Whilst people have their own preferences between leather and rubber, these materials can vary in quality. Ideally, a quality sole features a stacked combination of materials in the midsole and head. For instance, leather offers excellent breathability. However, it tends to wear down quickly on its own. Therefore, more expensive shoes and boots will feature rubber inserts to reduce wear or even coat them with a thick patina. Finally, shoes around the $300 mark will begin to feature more hand-made parts. From hand-stitching to hand-dying, the boots will have had more contact with artisans rather than machines. Not only is this more prestigious but it tends to result in better quality control as well as improved construction. Indeed, machines can quickly make good shoes. 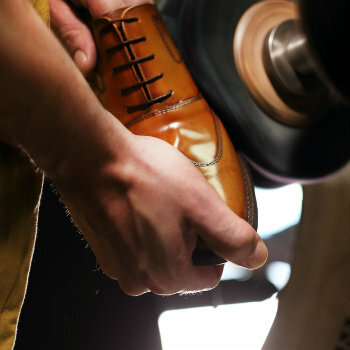 However, a skilled worker can apply years of experience to make great shoes. Furthermore, you’ll be supporting smaller workshops and skilled workers rather than factory conditions and cheap labour. Similarly, the materials will be more likely to be sourced from 1st-world countries and the shoes may be manufactured there too. Are Sub $300 Boots Worth It? Compared to lower price points, boots under $300 offer considerably more value for money and return on a long-term investment. The slightly elevated price tag grants you access to all the higher quality construction methods and materials that we listed above. However, as you’re only just entering the premium market, you may notice that prestigious brands and higher-end models out just out of reach. By just adding a touch more to your budget, you can actually comfortably enter the sub-$500 market. For instance, if you check out our guide to the best men’s dress boots under $500, you’ll notice that the majority of them aren’t much over $300! Nevertheless, the sub-$300 still offers excellent quality and we’re confident that you’ll be satisfied with whichever purchase you make from the above selection. Reviewed by Carlos A., on 19th September . "Quality boots. A great selection of boots that show off what I can buy for less than $300."